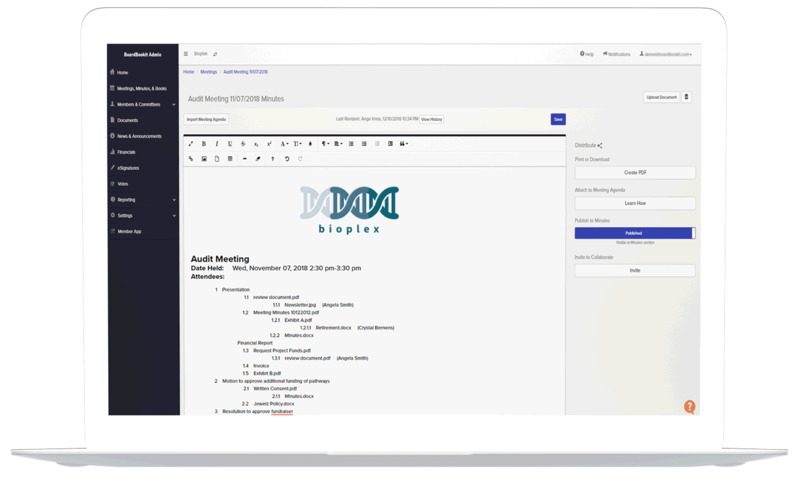 Engineered for board administrators to streamline minute taking before, during, and after meetings, BoardBookit simplifies board management of action items and board of director notifications. BoardBookit integrated board meeting minutes software is an effortless approach to minute taking that is flexible to adapt to your unique needs. Import a current agenda or create a new template with the help of our fully functional text editor. Add action items, board business, and attendance in an easy and elegant dashboard. After electronically sending minutes for approval, securely purge all drafts, and store in your paperless board book. 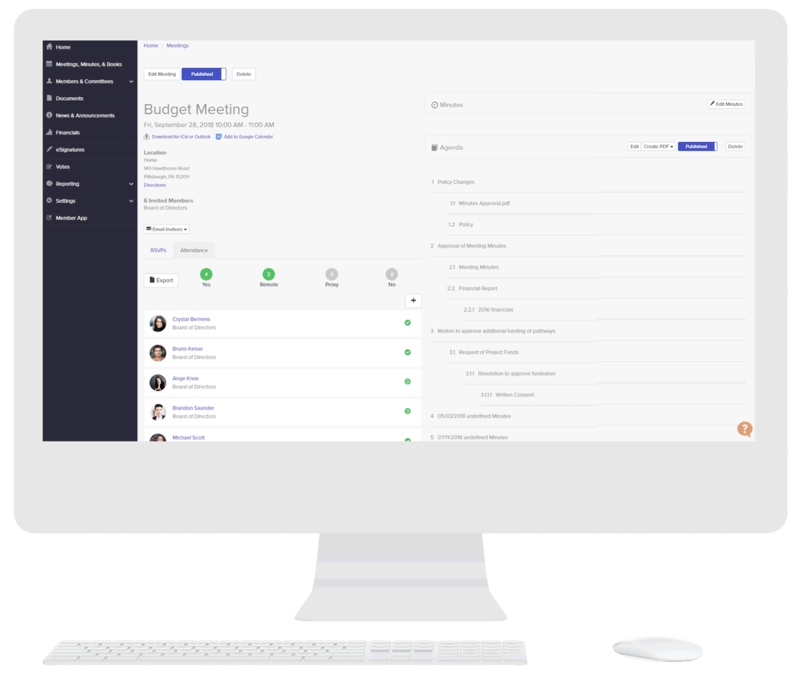 A seamless solution to minute taking and management, BoardBookit meeting minutes software is integrated in the secure BoardBookit board portal platform – no additional apps or fees required! 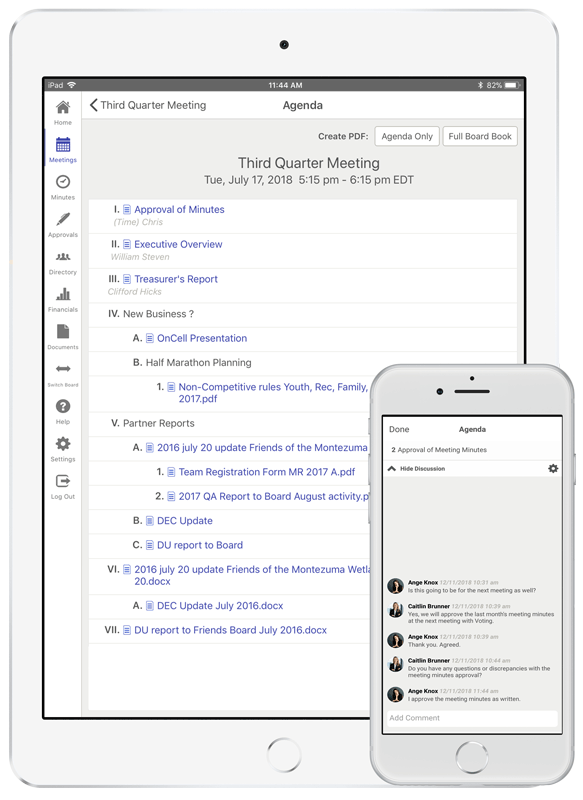 BoardBookit features an elegant and intuitive interface for board meeting minutes with feature-rich tools engineered by board directors for boards. Streamline your board administration with innovative BoardBookit board portal solutions. Create a new meeting minute agenda from scratch or upload an existing agenda. Our fully functional text editor allows for bulleted items, numbered lists, images, hyperlinks, and more. Multiple admins can collaborate on board meeting minutes while BoardBookit keeps the version history. Collaborate on board meeting minutes with secure discussions and messaging while BoardBookit retains the version history and allows for the purging of comments after meeting minute approval. When Integrated Meeting Minutes is used in conjunction with our exclusive attendance feature, admins can import board meeting attendance directly into the agenda with ease. Electronically send meeting minutes and use integrated Voting and eSign technology to gain board approval. When meeting minutes are approved, admins can securely purge all drafts and notes. The completed and approved meeting minutes are stored securely in the electronic board book. View notifications and agenda items prior to the start of a board meeting to be better prepared and informed. Discussions allow for secure collaboration prior to, during, and in between meetings. Directors can comment on agenda items and supporting documents in real-time. No need to refresh or synchronize. If signatures are required on documents or agenda items, sign off on items with BoardBookit eSign electronic signature technology with the tap of a finger. Utilize BoardBookit Voting to easily approve meeting minutes. The use of paragraph and text box areas allow for comments or clarification on certain agenda items. Preview and approve meeting minutes with the tap of a finger or collaborate with any time, anywhere access on your preferred device. It really is that easy. With BoardBookit Meeting Presentation Mode asking board members to open a document or jump to a specific page is a thing of the past. BoardBookit presentation mode will help keep the board on the same page. Everyone in the board or committee meeting will be in sync, following along on their devices as board book documents are presented.